Al-Afran al-Wataniyya is the bakery a stone’s throw away from Faisal’s. Born over 60 years ago, it is still going strong today. It survived most other businesses on Bliss Street. It bakes first-class Arabic bread, dull oriental petit four and exceptional manakeesh (plural of mankoushe). The time-honored mankoushe is a Lebanese flatbread topped with a mixture of pounded thyme, sesame seeds and spiced olive oil. It is baked until crisp in a commercial wood-fired oven. You can have a mankoushe for breakfast, as a midmorning brunch or as an afternoon snack. It sold for one quarter of a Lebanese lira and was wrapped in a newspaper sheet. It currently sells for 4,000 to 5,000 times as much and is wrapped in a sandwich paper. I think it smelled and tasted better in the old wrapping. A mankoushe is what I had every day for breakfast in the 14 months I worked as news bulletin editor for The Associated Press when still an undergraduate. The bookstore by that name had a wide range of titles and references in English and Arabic. It was run as a small family business and catered mostly to the AUB community. Being close to the university’s main entrance, it had the advantage of location. Two other Beirut bookstores, Librairie Antoine and Librairie du Liban, were better stocked in French titles. Khayat’s also leased a successful stationery shop on AUB campus grounds. Based almost under the famed Milk Bar, it filled part of the West Hall basement, right opposite the student mailboxes area. Aram, a bespectacled, rosy-cheeked and awfully decent Lebanese Armenian ran a billiard hall, that everyone simply called Aram’s, just next to Faisal’s. University students and their friends spent endless hours at Aram’s playing billiards, card games, pinball, foosball and backgammon. One late afternoon, I was at Aram’s enjoying a round of backgammon with a handful of friends, including Faisal Restaurant part owner Farid Saadeh. Three policemen, probably acting on a vindictive tip-off, walked in and asked to speak to Aram. When staff told them he was not there, they said they had to “question the five gamblers” seated around the backgammon board. They ordered us to carry the backgammon board, the 30 checkers and the pair of dice and follow them to the nearby Hobeish Police Station. It turned out “investigators” reviewed “arrest cases” with police station chiefs twice daily over the telephone. Sadly, ours had already made his late afternoon call when we were held. It meant we had to wait for his morning call. Early next morning, the “investigator” decided not to bring charges and ordered our release. We were free to go! 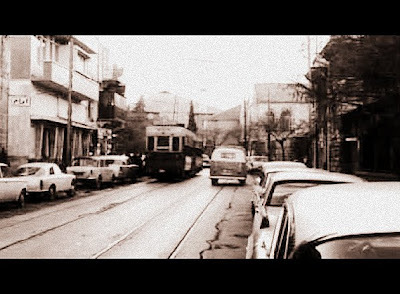 In the Fifties and Sixties, five or six stalwarts from the Itani, Shatila and Shehab families of Ras Beirut cobbled together in the narrow alleyway separating Aram’s and Faisal’s to run a private car hire business. Each owned his bottom of the range Fiat saloon that students could hire by the hour. So long as you were a “familiar face,” there were no papers to sign to rent a car, no documents to produce, no deposit to make, no penalty charges, no mileage limits, no pickup or drop off points – nothing. You just rented the car from one of Itanis, Shatilas or Shehabs at the agreed hourly rate and got on your way. One member of the ingenious lot was Tewfik Itani. He was short, skinny and good-humored. His Achilles' heel was horseracing. Whatever money he made during the week, he would gamble away at the racetrack over the weekend. Most weekends I sat at Faisal’s around sunset and usually saw him get off the tram at the station opposite and cross the street to his car hire point. I could tell from the expression on his face how he fared at the racetrack. When he looked too somber, I turned my face away, pretending not to see him. On one such occasion, he came into Faisal’s, passed by my table and intimated he wanted a drink. I told the waiter I will pay for his order. Moments later, Tewfik walked out with a tray holding a small flask of arak and a couple of appetizers. He placed the tray on the fringe of Faisal’s glass façade and went about the ritual of sipping his arak and nibbling. He looked my way occasionally and raised his glass in a toast. Khattab, a smart middle-aged but gray-haired man, was allowed by Faisal’s owners to plant his array of newspapers and magazines on one side of the restaurant’s entrance. University students, faculty and staff bought their preferred dailies or weeklies from Khattab. He knew who read what by heart. He prepared to give you your newspaper when he saw you coming. In the Nasserite period, you placed a “standing order” with Khattab to get your Friday weekend edition of Cairo’s official daily al-Ahram. It carried the fabled “Frankly Speaking” column of Mohamed Hassanein Heikal. The six square meter sandwich and refreshments shop of Jubran and Beshara Bikhazi next to Faisal’s was a crowd-getter any time of day. They served the world’s tastiest makanek sandwich. Makanek is the local version of spiced beef sausages. On the Bikhazis’ doorway sat Garabet, a pint-sized, stocky and bald Armenian shoe shiner who donned a knit Bobble hat at all times. He sat on a tiny chair opposite a modest wooden shoeshine box holding the full range of brown, black and neutral Kiwi polish, shine brushes and buffing cloths. 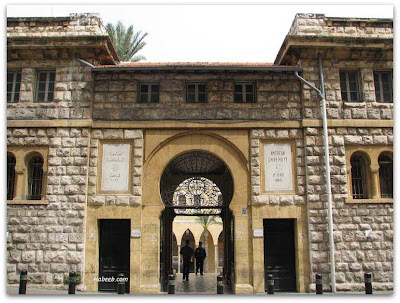 If you wanted to step in or out of the university in a squeaky pair of shoes, you would head straight to Garabet. The reach of his arms was so limited that he seemed to “hug” the shoe when brushing it. The shoeshine cost LL. 0.25 and Garabet worked nonstop in daytime, making good money. But his addiction to betting on horses at the bookie next door meant he squandered it all. His wife – who was of the same height but double his size – eventually decided she had had enough of his betting addiction. You think she checked him into rehab? There wasn’t one anyway! She simply got herself a tiny shoeshine chair and sat next to him with her left shoulder glued to his back. The missus started to pocket his earnings straightaway. It wasn’t long before Garabet turned into a reformed gambler. Two or three feet from Garabet’s spot stood the old fashion walk-in barbershop of Salim Jerdak. It was a six-square meter salon where guys got distinctively male haircuts, hot lather shaves with straight razor and mustache and beard trims. It was also the place to catch up on events. Other barbershops on the old Bliss were fancier and roomier. This one only had two facing mirror walls, three orthodox barber chairs and a waiting bench. Soft-spoken Mouallem (Master) Salim staffed the chair at the entrance. Jovial Jean, a short blond Armenian, was in charge of the middle chair. Chatty Ibrahim, who always styled his black hair with Brylcreem, controlled the third and last chair. The barbershop would not have been as enjoyable without a companion. The late Issam Chafic Ariss, God bless his soul, and I were playmates for years before becoming classmates at university. His mother prepared us sandwiches after our horseplay on the streets. Later, in our high school years, we met in the afternoons at his father Chafic’s posh home lighting store to watch foot traffic on Bab Edriss. Our first joint walk-in to the barbershop was for a haircut. Gradually, we started going there for smooth face shaves. That’s when Issam introduced me to “Pour un Homme de Caron,” an aftershave he bought at Amatoury on Bab Edriss and brought to Salim’s. I have used the fragrance since. It is now the signature scent of Tom Ford. Move the time machine forward to the late Seventies and you find Salim’s daughter Huda working for me at Monday Morning, the English-language weekly magazine I launched in Beirut in 1972. Leila Baroody, daughter of Faisal’s Elias Baroody, preceded her there. Leila and Huda were the first in the region to master the Electronic "Selectric" Composer, an automated, direct impression composition unit introduced by IBM in January 1975, one of which I acquired for Monday Morning shortly thereafter. Uncle Sam’s restaurant was Faisal’s nemesis: Americanism versus Arabism, community banter versus serious political conversation, hamburger versus hummus, male students wooing birds versus male students debating ideologies. Uncle Sam’s was the first diner in Lebanon to epitomize all things American – hotdogs, hamburgers, grilled ham and cheese, doughnuts, waffles, pancakes, chocolate mud, milkshakes, apple pies, percolated American coffee etc. The owners were Sami Khoury and Misbah Shatila, both stocky and short and both looking daggers at loudmouthed customers. But two welcoming waiters made up for what the co-owners lacked in subtlety -- ageing Abu Zakkoor and macho Salim (some coeds were secretly obsessed with him).